A new release of Reveal (v19) is available to all users with a current license, and as a 14-day trial. Inspect gesture recognizers attached to your view hierarchy - we’ve added full support for viewing and inspecting gestures in the outline view. Broken layout constraints now provide more information about what is broken, and by how much. Support for Xcode 10.1 has been added. Performance when saving a Reveal snapshot has been significantly improved. 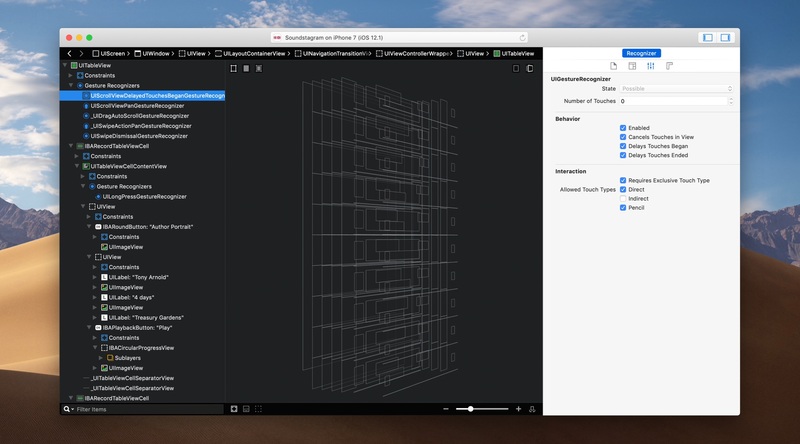 Performance when resizing the view hierarchy outline view has been significantly improved. Disabled serialization of Display P3 images for Simulator targets. It turns out that the Simulator does not render P3 images at all - this should speed up loading and reloading, as non-P3 images are smaller in size. Fixes to visual problems that occurred under Mojave’s dark mode, including light scrollbars being shown in the outline under the light appearance (even though the content is always dark). Fixed an issue where nil enumeration values did not show appropriate values in the enumeration and mask inspectors. Fixed an issue that was letting the transformation inspector fields grow too wide when displaying long values. Bitcode is now properly enabled for RevealServer when targeting devices - it is not included for Simulator builds.